After blogging for just a little over two years now, I have finally caught the Blogging Virus. This may be a little hard to understand for those of you who don't blog yourselves so I will explain it to you. Compared to the other bloggers who grace the screen here at The Whacko Blogs, I am relatively inexperienced. I think that makes me the best candidate to explain this Blogging Virus issue because I have recently caught it. There are hundreds of reasons that one may choose to start a blog. Generating a reader base is probably the biggest reason. Whether you're an author or a business owner, it's nice to generate a large following to promote whatever it is you're selling. Maybe you're an "expert" in your field and you want to share your knowledge and grow your own through research, writing and feedback. Or, if you're like me, you just like to ramble on about stuff and it's fun to see it online. 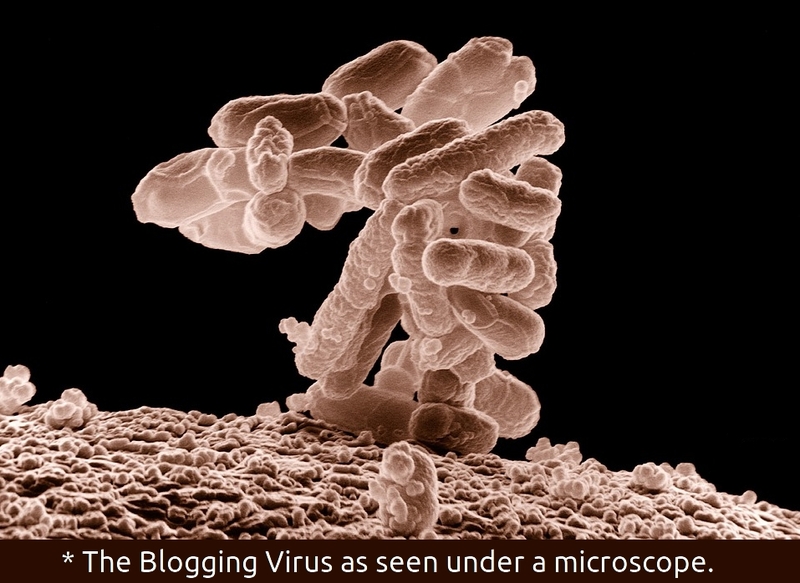 So where does the Blogging Virus kick in? It's different for everyone. For me it was around the two year mark. At that point I suddenly went from a relatively unknown blog hidden on the internet to having my views shoot up and the comments started rolling in. That writer-reader interaction spike is what did it for me. I can say that I write for myself all day long, but in reality - it's a lot more fun when your readers are interacting with what you do. I've made a number of new friends along the way too! Ok. Back to the virus thing.... Blogging is a passion for whatever reason you find drives you, but it doesn't start out as contagious. In the early days you may struggle to find your niche and generate content to write. Once that Blogging Virus kicks in though, there's no turning back. I have people ask me all the time how I come up with ideas for blogs. Well, first of all, they're not all great ideas and I admit that. What I have learned though is that the more blogs I write, the faster the content seems to come to me. If I set a schedule to write one post a week, I would probably struggle for an idea because I couldn't narrow it down. I have found that writing closer to one a day seems to generate more ideas that I have the time to write out. When the Blogging Virus hit me, I started branching out to other blogs like Life Explained and The Whacko Blogs as alternate platforms to ramble on for a new group of readers. Blog sharing (or whatever the "real" term is) has kicked my Blogging Virus into full gear. It gave me multiple platforms with slightly different themes to fit my blogging ideas. Sure, I could have just created more offshoot blogs of my own, but I would have been missing the best part of the Blogging Virus - Collaboration. Working with other bloggers, sharing ideas and playing off each others' posts is a blast. It gets the creative juices flowing. In an instant your head full of ideas just explodes. It's contagious. The good thing is that this Blogging Virus isn't something to be afraid of. It's something you want to nurture and grow.